Each recipe addresses a specific problem and includes a discussion that explains the solution and provides insight into how it works. If you're a beginner, this book will help get you started. If you're an intermediate user, this book will jog your memory and expand your horizons. 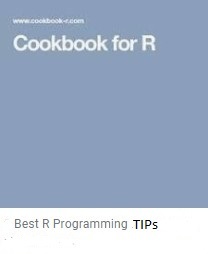 You'll get the job done faster and learn more about R in the process. R is a powerful tool for statistics, graphics, and statistical programming. It is used by tens of thousands of people daily to perform serious statistical analyses. It is a free, open source system whose implementation is the collective accomplishment of many intelligent, hard-working people. Winston Chang is a software engineer at RStudio, where he works on data visualization and software development tools for R. He holds a Ph.D. in Psychology from Northwestern University. In previous lives, he was a philosophy graduate student and a computer programmer.